Waaaaay back in November, Matthew and I traveled to Las Vegas, Nevada to participate in the Las Vegas Rock 'n' Roll Half Marathon, also known by the hashtag, #stripatnight. I had my eye on this race for a long time- but traveling to Vegas from the east coast isn't cheap and let's be honest, Vegas itself isn't cheap! But, Matthew and I decided that 2015 would be the year we'd run the strip at night. So we did! A few years ago, Matthew surprised me with a trip to Vegas for my 28th birthday so we had visited this city before. 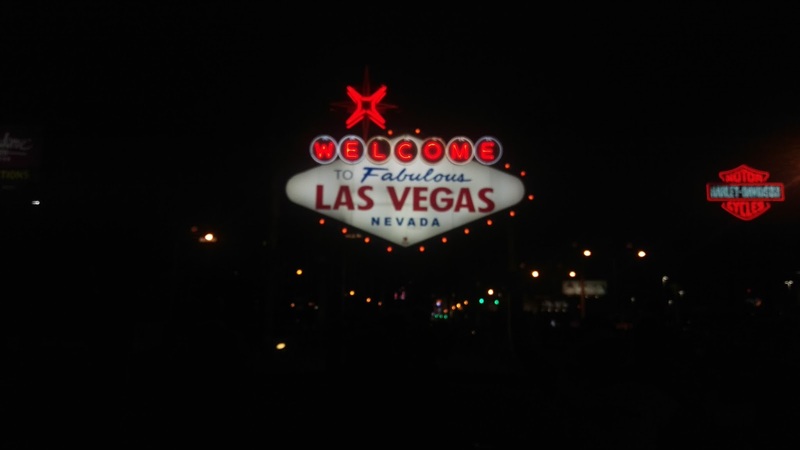 During the last trip, we spent a lot of time sight-seeing and taking in the awesome entertainment and restaurants that Las Vegas is known for. We were both looking forward to visiting Vegas again and conquering the strip at night. We flew to Vegas on Friday. The race was on Sunday evening (start time of 4:30 pm) and we wanted to enjoy ourselves a bit before we ran the half marathon. 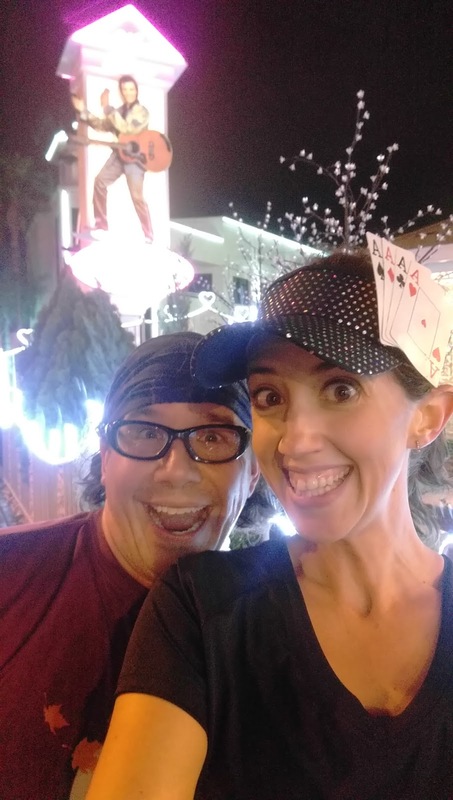 Once we landed and got to the hotel (we stayed at Bally's), we planned out our walking route to the expo- at the Las Vegas Convention Center. 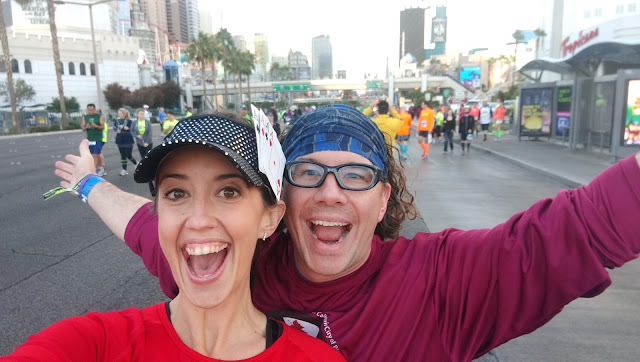 When we booked the hotel, we chose Bally's because it was right next to the finish line and only about three miles from the expo- close enough to walk. However, trying to walk anywhere on the Las Vegas strip is damn near impossible. You have to take all these bridges to get across the street and the bridges lead into the casinos and then you've got to take this round about way to get out on the street level again. It's frustrating and annoying. So we caught a cab and spent another $20 to ride the 2.5 miles to the expo- we'd already shelled out $25 for a cab from the airport to Bally's. There's no convenient way to get around Vegas without renting a car. We arrived at the expo and luckily, it wasn't very crowded. 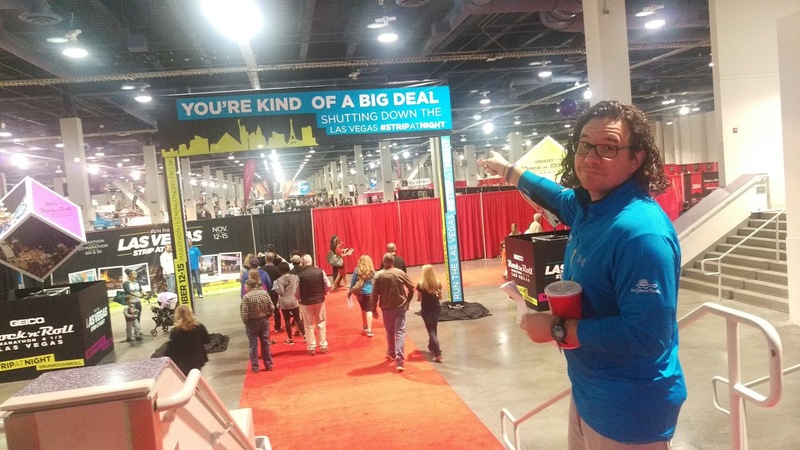 There was some very cool signage as we walked in to get our bibs, shirts and explore the vendors. Large sodas are necessary for expo-exploring. After the expo, we did walk back to our hotel- we found a route that didn't involve the strip. We relaxed in our awesome, upgraded room and then headed out to find an inexpensive dinner. We ended up eating at this little dim sum place in between Bally's and Paris- there's this little underground tunnel/shopping mall thing that connects the two hotels and it's full of casual restaurants and shops. We ate there a lot during our trip. two over-sized chairs, and a huge TV. Not too shabby. On Saturday, we explored Vegas a bit, going to the Titanic exhibit at the Luxor and then walking the strip- and maybe gambling a little bit :-) We also hung out in Paris' hot tub (Bally's pool was closed for the season so we were able to use the adjacent hotel's pool and hot tub) and went to see Penn and Teller's show that night. They were awesome, by the way. Sunday morning we slept in and then had crepes for breakfast (there was a little crepe stand in the strip mall thing) :-) Then we headed back to the hot tub (with some mimosas!) and ended up relaxing there for most of the afternoon. There were a bunch of other runners in the hot tub too so we ended up just hanging out and talking shop for quite a while. Around 1 pm, we headed back to our room to get ready for the race. We had about a two mile walk from our hotel to the race start. However, everyone we'd talked to told us to take the monorail down to the start because there wasn't a clear path to walk. So, after our pizza dinner in the food court of our hotel, we paid the $11 for two monorail tickets and walked out to the monorail station behind our hotel. Holy. Crowds. It was mass chaos trying to get on the monorail. Each car that came was jam-packed and yet somehow, more people kept cramming into the car at our stop. Thirty minutes- and eight over-stuffed monorail cars later- we finally squeezed into one. It was miserable. I'm not claustrophobic, but this experience might have made me have a panic attack. Luckily, we only had to ride less than five minutes until the last stop, near the Mirage resort. Then we had to walk about ten minutes to the start. As we got closer to the start, race officials started herding us towards a mass of people getting through a security "bag check." We had no bags but still had to suffer through a mass of thousands of people trying to get through three security lines. Super annoying. We finally got through security and then headed towards the port-a-potties- which we had to exit the "secure area" to get to! So we waited in all that line for NOTHING! What a freaking cluster! Added to this pre-race frustration was the weather. It was a little chilly (50-60's) but was incredibly windy. Lots of dust and dirt was getting kicked up off the ground and getting in our eyes- not the most fun experience. 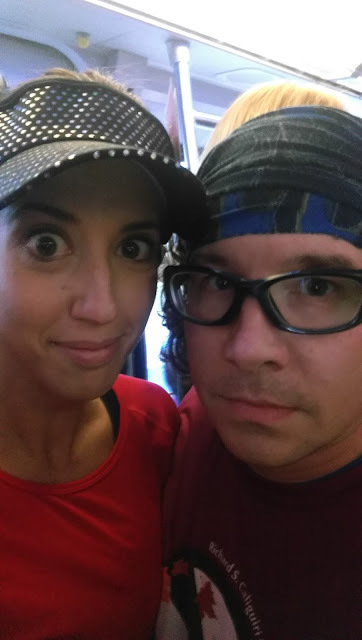 We finally made our way to the corrals and waited for the race to start. They made several announcements about the weather- it was going to be very, very windy and possibly rainy. Race officials suggested that full marathoners drop down to the half (they run the same course until mile 11 or so) if the weather was hindering them. 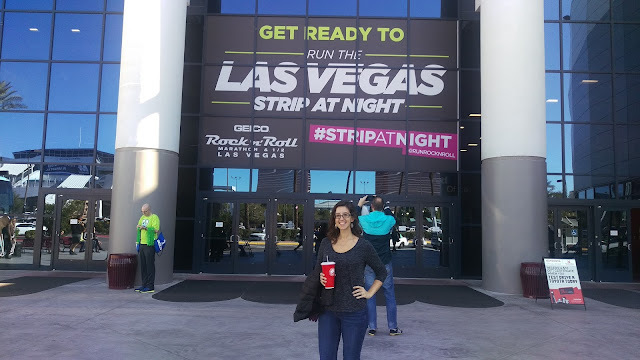 Ready to run the strip! Panoramic view of the starting line. Dusk settled in quickly and by the time it was our turn to start, it was dark. The first few miles of this course are an out-and-back and take you south on the strip towards the famous "Welcome to Fabulous Las Vegas" sign and the airport. This part was super windy and dusty- the winds clocked in at 45 mph! The actual miles on the strip were still pretty cool, despite the weather. It's wild to be running on the strip with absolutely no cars on the road. And there are lots and lots of people (mostly drunk) cheering for you on the sidelines. There's a TON to look at and there's loads of entertaining music to keep your mind occupied. 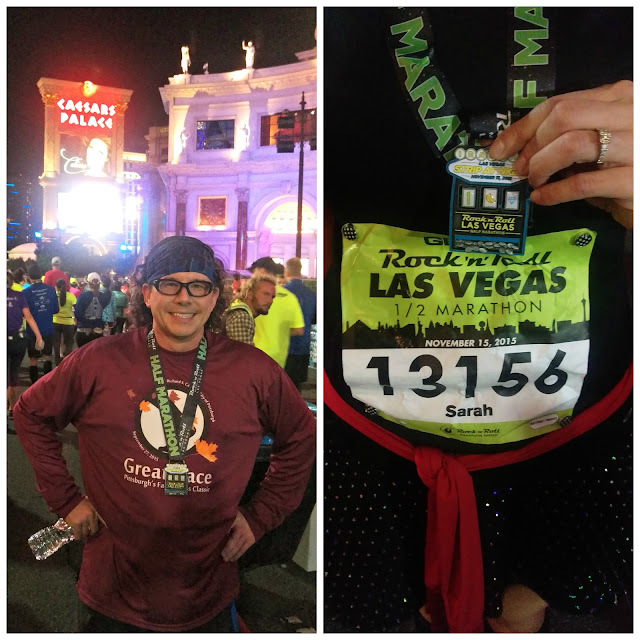 This course runs all the way into "old Vegas" but new Vegas was my favorite part of this race. One of my favorite casino entrances. After we passed Treasure Island, we headed towards old Vegas/Freemont Street. By this point in the race, around mile 5-6, my right foot started throbbing. As you might remember, this fall I had some wicked-still-unexplained foot pain and it reared its ugly head during this race. I took some tylenol and tried to distract myself from the pain by focusing on taking in the sights. It was definitely much quieter in old Vegas. There were hardly any spectators (I think the weather discouraged folks from standing outside) and there seemed to be a lack on entertainment on this part of the course. Also, we had no idea what mile we were at because the wind was so bad all the mile markers had been knocked down! At some point, we turned off the strip and were running in a very sketchy looking, dark neighborhood. Around mile 10 (I think? ), there was this massive DJ booth and tons of race volunteers dancing around with lots of lights and disco balls and fog machines. This was a welcome oasis in the otherwise desolate part of this course. 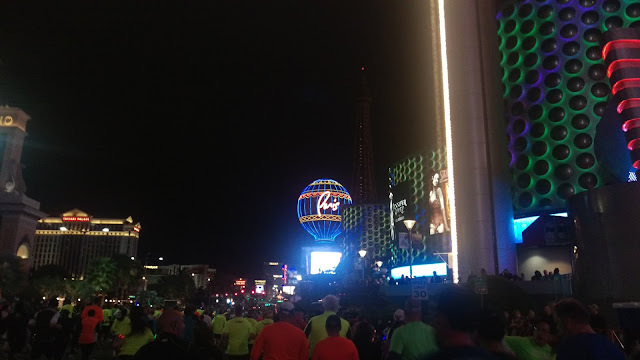 Eventually, we turned back onto the strip and started making our way back to the finish. The wind REALLY picked up here and started to take a toll on us. At some points, it didn't even feel like we were moving forward because we were running straight into the wind. It was the kind of wind where your eyes were constantly watering and stinging so all you could do was look down at the ground. Finally we saw the finish up ahead. My foot was throbbing, I was freezing, and all I wanted was to get a hot shower and eat some food. Matthew and I mustered up what strength we had left and powered through the vicious wind to the finish. We crossed at 2:39 and some change- the same finish time we had in Philly two weeks earlier. Thankfully, race volunteers were giving out heat sheets so we were able to warm up quickly. The medal for this race was super cool- it glows in the dark and each of the numbers (13.1) spin like the icons of a slot machine. We grabbed our other free goodies (chocolate milk, pretzels, beer) and headed straight back to the room. I was so glad we booked at Bally's- the lobby of the hotel was literally the end of the finisher's chute. Next up, showers and food! Because of the late afternoon start time, we were showered, dressed, and ready to go out after the race by 8 pm. Matthew wasn't feeling well so instead of going out to eat, I went down to the strip mall thing connecting Bally's and Paris in search of food to bring back to our room. Fifteen minutes after I left the room, I started to feel sick to my stomach. So I bought food at the closest place I could find- two peanut butter and jelly sandwiches ($25! ), a ginger ale, and went back up to the room. We ate and then went straight to bed, both of us feeling crappy and beat up. The next day, we spent the entire day flying home. It's a six hour flight and with the three hour time difference, we literally traveled all day. I definitely don't enjoy return flights from the west coast. Will we do this race again? Nope. Several reasons: It's an expensive race. Las Vegas itself is incredibly expensive. Traveling to Las Vegas is time-consuming and costly. The pre-race area was chaotic and disorganized. Getting around Vegas is pricey and convoluted. The race itself wasn't THAT awesome that we'd need to do it again. This race was a one and done for us. 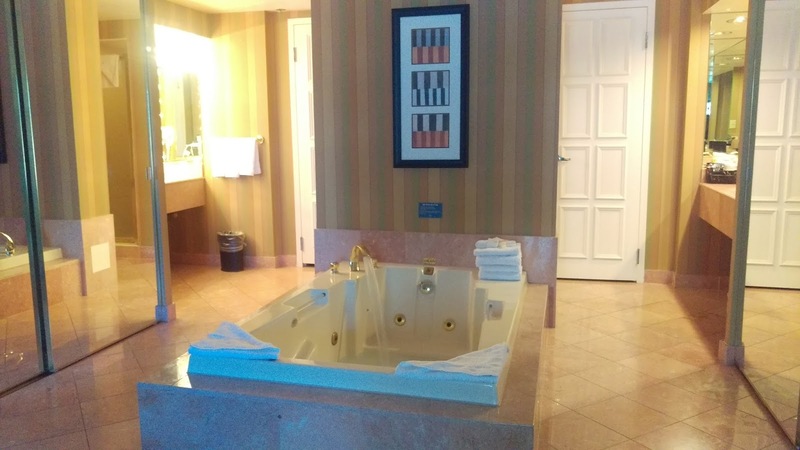 Las Vegas- love it, hate it, or somewhere in between? 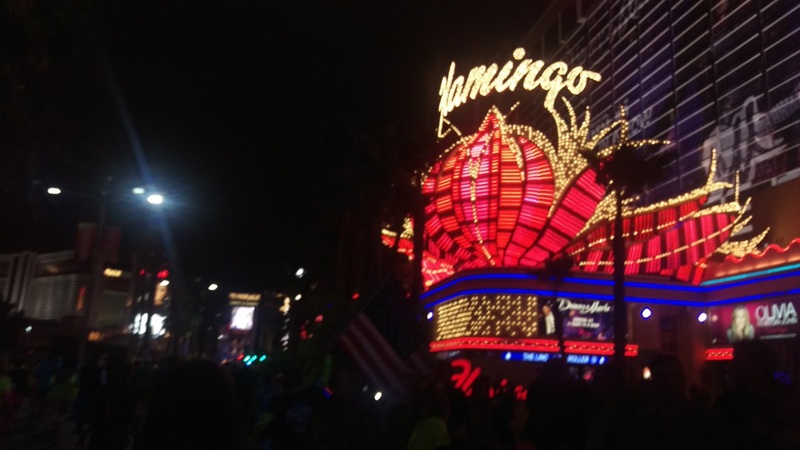 I first did the Vegas half in 2007 before Competitor bought it and it became Rock and Roll. It was in the morning back then. Competitor bought it the next year and from 2008 on, it was still in the morning with a stop and start in the same place. I did it every year. It's about a 4 hour drive for me and I have friends who live there, so it was a fun one to do. Then in 2011 they changed it to night time and vastly increased the field. I hated it so much, I haven't gone back to do it again. It's still in a colder time of year and without the sun coming up, it actually gets colder as the time passes. It sounds like the expo, stop and start are in different places now which makes picking a hotel kind of a pain. It was easy when all the action was in the same end of the strip. Obviously it's still a big draw, but I'm out as long as it's at night. At least you got to try it out and see how you felt! The strip really isn't too hard to navigate once you've done it a few times. You just have to know the ins and outs. Kinda like DisneyWorld. The first couple of times, though, I can see why you'd get irritated. Sorry to hear that you and Matthew didn't have the best experience running the strip. Its a shame that the pre-race area was as chaotic as it was - that doesn't seem to be consistent with the other RnR races that I've run. And of course the weather didn't help your race experience, but it does seem that you guys made the best of what the weather handed you. The good thing is that there's plenty of other great races out there to choose from. Yeah, it was really disappointing. I know there were thousands upon thousands of runners and that it's hard to organize that many people. But, some signage would have been SUPER helpful. And you are absolutely right, there are plenty of races for us to choose from! I loved reading your recap. 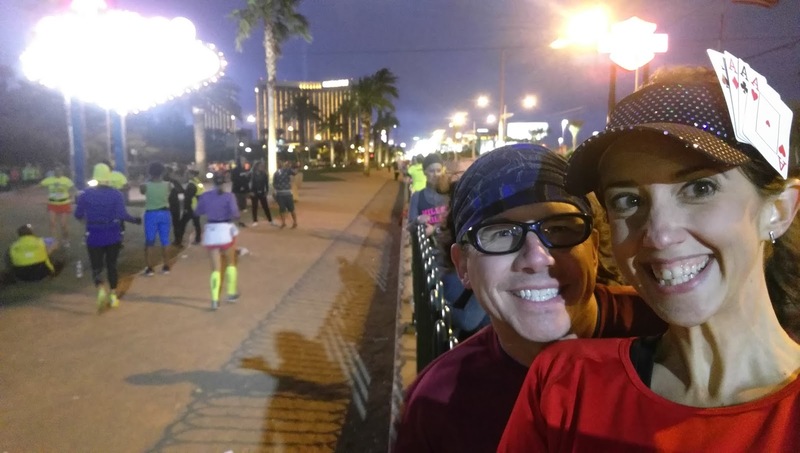 We ran RnR Vegas in 2014 and had a similar experience. 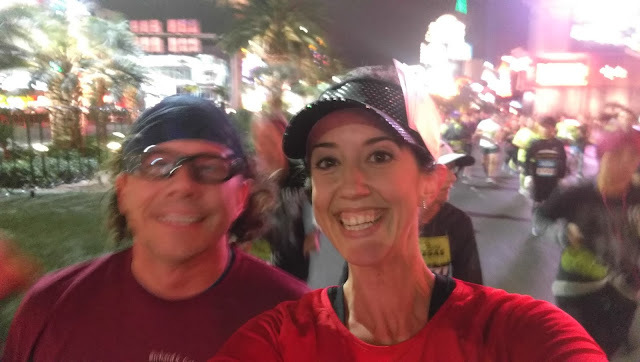 We stayed at the far end of the strip (close to expo and 5K start) but had to take that dreaded monorail to get to the half/marathon start. It was very cold during our race too and almost freezing by the time we finished. I had my best race time at the half and my sister had her worst race time in the full. She said the full marathon was awful and wished she had only done the half. I definitely appreciated the experience but like you said, it's a very long flight from the East coast and not one I'm dying to do again! Thanks for the recap! I'm running it this year for the experience. I live in FL, and always assume that all places are still warm at all times of year. LOL. Thanks for sharing that experience. You're welcome! I hope you have a great time- just pack a jacket! :-) Good luck!